I admit, I shouldn’t have been rendered speechless when Ruth Broyde Sharone told me, nearly two years ago, that she was working on a new project: “INTERFAITH: The Musical.” I was stunned, finally murmuring, “A musical? !” Was she foolish or fearless or, probably, both? 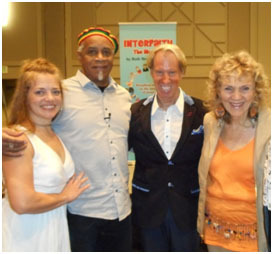 Singers DelAnne Jessop Haslam (l.) and Bo Powell, concert pianist Danny Wright, join Ruth Broyde Sharone to premiere songs from “Interfaith – The Musical” at the 2015 Parliament of the World’s Religions in Salt Lake City. Ruth is an interfaith filmmaker, author, speaker, grassroots organizer, networker extraordinaire — and now the creator of a new musical about interfaith. She has written more than 40 feature stories for TIO, including this month’s story about being proselytized by a sect of fundamentalist Christian Jews. When I initially heard Ruth was going to conduct a workshop on her musical as a “work in progress” at the Salt Lake City Parliament of the World’s Religions, I knew I’d been right about her fearlessness. I determined to suspend my disbelief and attend her presentation. More than 100 of us wandered into the workshop on the final day of the Parliament. Ruth had a boom-box, a CD, and a huge smile. She began by sharing how the musical had come to her – the lyrics and the melodies – when she took her morning walks. Ruth shared her fervent dream that her Parliament workshop would be approved and that – without a budget – she’d find a couple of soloists, a brilliant pianist, and a grand piano. An impossible dream, but fervently wished for. A quarter-hour into our session, the metal wall on one side of hall slowly clanked its way up to the roof. Leaving their truck, two muscle-men rolled a concert grand piano into the room, up a ramp, and set it on its legs. Danny Wright, an extraordinary pianist was introduced, along with two soloists, and we were transported. Grassroots interfaith activism has taken Ruth hundreds of thousands of miles around the world to countless events. She serves on the board of NAIN (North America Interfaith Network), is co-chair of the Southern California Parliament of the World’s Religions (SCCPWR), and is an active contributor in URI programming. Her film God and Allah Need to Talk has been screened across the country and globally and her award-winning interfaith memoir, Minefields and Miracles: Why God and Allah Need to Talk, is considered a primer for interfaith engagement. All of which gives her a deep, visceral, appreciative understanding of the complexities and nuances of interfaith relationships. Her wisdom, somehow, alchemically, gracefully, found its way into the music and lyrics. We heard five or six pieces from the new musical in Salt Lake, and the real treat was finding 11 on the start-up CD. The songs are dramatic, comical, and poignant — in sum, deeply moving. We laughed and cried hearing songs with titles like…What If My Children Go Astray, Spiritual But Not Religious, Blasphemy, Why Can’t Religion and Science Be Friends?, It’s Not a Game, and There Ain’t No Monopoly on Spirit. The musical, already full of jewels, is on a definite timeline. A website is being created. The story is being hammered out, and a crowd-sourcing fundraiser is planned later this month. Ruth's goal is clear – to have “Interfaith: The Musical”land on Broadway on the wings of peace. You can follow its development at the musical’s Facebook page. Jan and I bought 20 copies of the CD and are giving it as Christmas presents. To get the CD and find out how to support the project, write Ruth as InterfaithTheMusical@gmail.com or call her at 310-733-8313. Newer PostDoes Protecting the Right to Proselytize Violate Religious Freedom?